Regardless of an applicant's qualifications, we always look for one attribute in particular -- the desire to provide high-quality products with excellent customer service. We can train people how to work with clients or run pieces of equipment, but to have passion for customer service and pride for your work takes a unique individual. To apply for a career with DeVine Promotions & Printing, please submit your resume through our online file transfer tool. Thank you for expressing interest in a career with us. We are family owned and operated and strive to give excellent quality and customer service to all our customers, small and large. 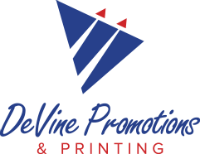 Come see what working at DeVine Promotions is all about!